The premises comprise a prominent and detached Grade II Listed property situated in the centre of Haslemere being of brick construction beneath a pitched and tile covered roof. The ground floor accommodation is presently arranged in 2 x separate elements extending in total to some 915 sq ft. whilst the first floor is currently arranged so as to provide additional offices, kitchen and WC facilities extending to some 905 sq ft of NET office space. The first floor also has a separate rear access leading to Petworth Road whilst there is also a small courtyard area to the rear. 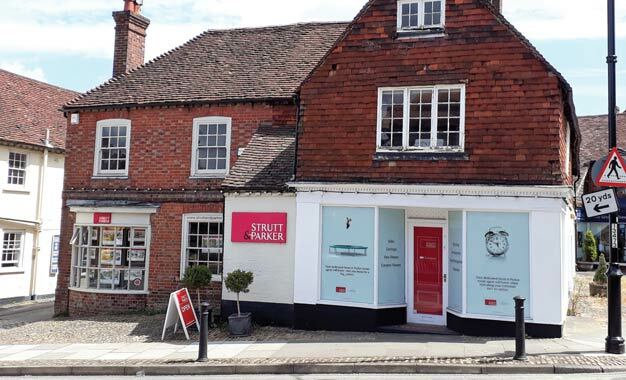 The property is situated in the centre of Haslemere in a prominent position being close to the junction of the High Street and Petworth Road. Haslemere is a prosperous and attractive Market Town situated in the South-West corner of Surrey close to the West Sussex and Hampshire border. Haslemere benefits from good road connections to London (44 miles via the A3), the ferry port at Portsmouth (26 miles) whilst both Gatwick and Heathrow Airports are some 40 miles and 50 miles distant respectively. Haslemere mainline railway station is close by and provides a fast and regular service to London (Waterloo). Haslemere town centre offers a selection of restaurants, pubs and cafes alongside a good mix of multiple and independent retailers within close proximity, retailers already established in the town include Waitrose, Caracoli, Lloyds Bank, Lloyds Pharmacy, Space NK, Starbucks and many others. 16-18 High Street, Haslemere. GU27 2HJ.